Today (November 16) sees the release of the new album from Hen Ogledd, titled Mogic. Out via Weird World, the album is the first from the group since they expanded to become a quarter, comprising Richard Dawson, Rhodri Davies, Dawn Bothwell and newest member Sally Pilkington, who makes her first recorded appearances for Hen Ogledd on this album. Mogic sees the group combine themes surrounding technology and old mythology, bringing into the fold their respective backgrounds in different parts of the north, and sharing vocal duties across each of the album's tracks. Keep reading below for a quick catch-up with the group discussing the themes explored on the album as well as their expansion from a trio to a four-piece. Head here to read our review of the album and here to purchase a copy. When it comes to recording the tracks, how do you decide who sings on each? Does it simply come down to who writes what? Dawn Bothwell: Generally speaking whoever wrote it vocalised the track. I guess we might be worried that something would be missed out otherwise! Sally Pilkington: In Mogic we generally each sing the songs that we have written, apart from on 'Tiny Witch Hunter' which was written by Richard and sung by me, mainly due to the challenge of playing a hectic bass line and singing at the same time! It felt like a positive thing for us each to have a voice on the record, but there are also tracks where the vocals are communal. For the gigs we have mixed things up a bit too. Richard did the vocals for 'Transport and Travel' on the album, and this track was largely constructed in post-production. When we came to play it live it was tricky for him to do bass and vocal, so I'll be announcing the modes of transport instead. We're still working on convincing Rhodri to sing 'Love Time Feel' for the gigs! How and when did Sally get involved in the project? Richard Dawson: We'd initially talked about Sally coming in as a dancer and somewhere along the line it morphed into her playing keyboards. It happened..... hmmmm, maybe the best way I can describe it is like a plant unfurling or a flower opening its petals. It wasn't really a question, just a natural thing. Could you give us a sense of how you switched from being an experimental improv/instant composition group to being a pop group and what Sally's addition brings to the group? Rhodri Davies: I don't think of there being a big switch from one state into the other. I see the group as being fluid and occupying multiple personalities all at the same time. RD: The tendency is to see composition and improvisation as two separate approaches but they're two facets of the same thing, or two methods of getting at the same thing. Something that's composed has to still be spontaneous, and you have to embrace contradiction to make it so. And something improvised can easily be fixed and staid. The life in music is animated by listening. DB: Sally brought some (fantastic) songs to the album but I wouldn't typecast her as the ‘pop’ one - I know that whatever she goes on to do she has ambitions for some pretty obscure, dark and mishy sounds. I'm sure it will be fabulous. The general tack was that this time we individually brought some songs to the table, used this as a starting point and then we improvised them out together. Last time we started with improv. SP: The idea of writing some pop songs brought a different approach in terms of creating more set and structured music, but when we recorded these songs there was still a big improvisational aspect. When it comes to playing live, some tracks are more fixed than others, but a lot of the set is very open - it's a funny mix but I think experimentation and improvisation remain at the heart of Hen Ogledd. There are themes on technology explored on the new album. How much time do you each spend on the internet, and would you say it has too much of an effect on your day-to-day lives? 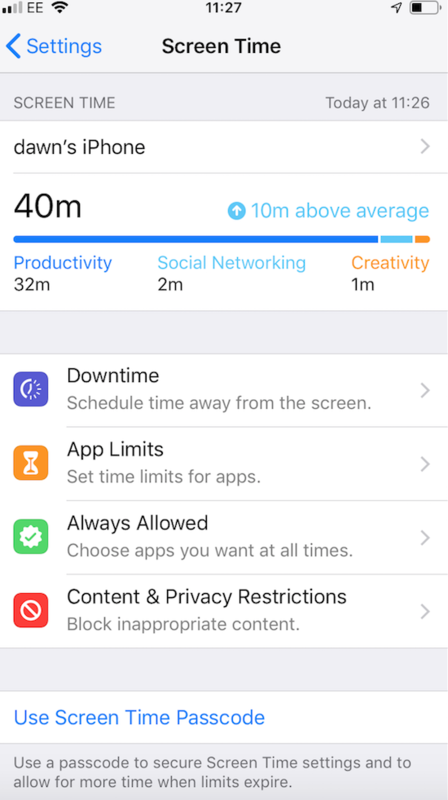 DB: Have you got 'screen time' on your iPhone ? Here is mine. Today has been very productive, not very creative... that’s a concern! RD: I have been drastically scaling back my time on social media as I found it was having a negative effect on my mental health. It can do funny things to the wiring of your brain, you've got to be careful - look after your perceptions! Did you do much research on different areas of mythology for this record, and if so, did anything new you learnt have a large effect on yourselves on a day-to-day basis? DB: I was thinking about old centres like Govan during the Hen Ogledd period. It was central to Alt Clud (the kingdom of Strathclyde). I grew up nearby in Paisley and I wrote about going to see the Govan Stones with my family - how they highlight the weirdness of the shift of an area from prominence to poverty. I started thinking about wider representations of people there - the writer James Kelman who is from Govan has been crucial to representing people cast out from the wider media. He is referenced in the lyrics to 'Transport and Travel': "'How late it was, How late'... when I returned to Govan." I feel the new album explores themes of what it means to be British. What did you think of Theresa May's latest statement on Brexit? RD: I'm not sure any of us have the necessary words to describe feelings around this. Let's just say - we hope Mogic can be a powerful antivenom.